Brazil is the ninth-largest liquid producer in the world and the third-largest producer in the Americas. Brazil is a significant energy producer. In 2016, Brazil produced 3.24 million barrels per day (b/d) of petroleum and other liquids, making it the world's ninth-largest producer and the third-largest in the Americas behind the United States and Canada. 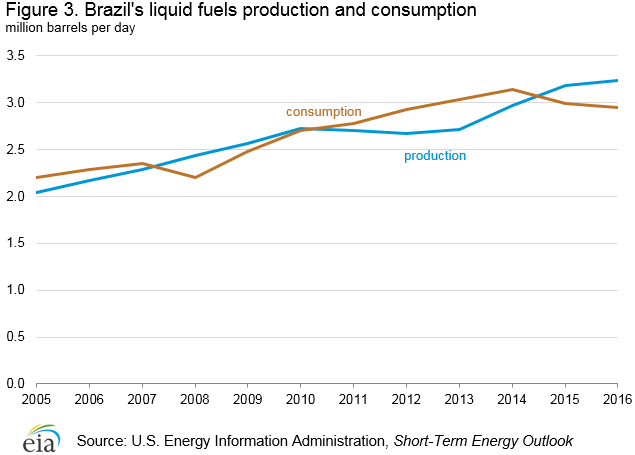 Increasing domestic oil production has been a long-term goal of the Brazilian government, and discoveries of large, offshore, pre-salt oil deposits have transformed Brazil into a top-10 liquid fuels producer. Brazil is the eighth-largest total energy consumer in the world. Brazil's energy consumption in 2016. Brazil was the largest producer of petroleum and other liquids in South America in 2016, surpassing Venezuela. State-controlled Petrobras is the dominant participant in Brazil's oil sector, holding important positions in upstream, midstream, and downstream activities. The company held a monopoly on oil-related activities in Brazil until 1997, when the government opened the sector to competition. Royal Dutch Shell was the first foreign crude oil producer in the country, and since then it has been joined by Chevron, Repsol, BP, Anadarko, El Paso, Galp Energia, Statoil, BG Group, Sinopec, ONGC, and TNK-BP, among others. Competition in the oil sector is not just from foreign companies. Brazilian oil company OGX, which is staffed largely with former Petrobras employees, started to produce oil in the Campos Basin in 2011. Petrobras is currently under investigation in Brazil and in the United States for bribery and money laundering. The investigation into the multi-billion dollar corruption scandal (Operation Car Wash) started in March 2014 with the arrest of Paulo Roberto Costa, head of refining operations for Petrobras (2004-2012), who was accused of money laundering. The scope of the scandal escalated further with allegations of government corruption and a kick-back scheme, resulting in losses by Petrobras of more than $8 billion, multiple arrests, and the resignation of the CEO, Maria das Graças Foster. More than 80 people have been charged with bribery and money laundering, including some of Brazil's most prominent politicians and business owners. Petrobras' new CEO, Aldemir Bendine, was appointed in February 2015.He was arrested for corruption in July 2017. In August 2016, President Dilma Rousseff was impeached and removed from office by Brazil's senate because her 2014 presidential campaign received illegal donations through Operation Car Wash. Former president Luiz Inacio Lula da Silva has also been accused of involvement in the corruption scheme. Michel Temer of the centrist Democratic Movement Party, PMDB, was named interim president until the 2018 elections. In May 2017, President Temer was formally accused of conspiring to obstruct the investigation, setting the stage for a constitutional battle between the judiciary and the executive branch of the government and prompting calls in congress for his impeachment. President Temer has denied the charges. Petrobras is the most indebted company in the world, with total debt of $122.7 billion at the end of third quarter 2016. In 2015 and 2016, Petrobras's divestment program resulted in $13.6 billion in asset sales, missing its $15.1 billion target by $1.5 billion. The target was missed because the sale of the Tartaruga Verde and Baúna fields, located in the Campos Basin and Santos Basin, were not finalized in time. Petrobras now plans to divest $21 billion in assets (the value of the missed 2015- 2016 target plus the 2017- 2018 $19.5 billion target) between 2017-2018-including its transportation and retail distribution arms, Transporte S.A. (Transpetro) and BR Distribuidora. Transpetro dominates Brazil's midstream segment with ownership of 99% of the country's oil product pipelines, and 59% of product storage, while BR Distribuidora maintains a 32% share of Brazil's retail fuels market. The principal government agency charged with regulating and monitoring the oil sector is the Agência Nacional do Petróleo, Gás Natural e Biocombustíveis (ANP). ANP is responsible for issuing exploration and production licenses and ensuring compliance with relevant regulations. In February 2017, the Brazilian Energy Ministry proposed changes to rules regarding minimum percentages of the locally-sourced goods and services required in exploration and production contracts (known as local content), reducing requirements by approximately half. Brazil's previous local content rules were seen as a disincentive for investment due to the limited and uncompetitive local supply chain. Previously, oil and natural gas operators in Brazil were required to source up to 85% of equipment and services from domestic industry. This percentage was one of the highest local content requirements in the world, contributing to high breakeven prices. The proposed February 2017 changes to the local content rules will affect contracts for older bid rounds, including the first-ever production-sharing agreements, and projects through 2030. These changes could significantly affect Brazil's rate of oil production growth in the future, with breakeven prices falling to $51 per barrel, according to IHS Markit analysis. The new local content rules would set the overall requirement at 50% for onshore projects, and offshore deepwater projects would see the overall requirement for exploration set at 18%.The government also proposed less stringent fines for companies that are unable to fulfil these local content requirements. However, companies will no longer be able to apply for a waiver of these fines. The Oil & Gas Journal estimates that as of January 2017, Brazil had 13 billion barrels of proved oil reserves. This amounts to the second-largest level in South America after Venezuela and almost 1% of the world's total reserves. More than 94% of Brazil's oil reserves are located offshore, and 80% of all reserves are found offshore near the state of Rio de Janeiro. The next largest accumulation of reserves is located off the coast of Espírito Santo state, with about 10% of the country's oil reserves. Reserves are expected to rise as pre-salt resources are further explored. In 2016, Brazil's production of petroleum and other liquid fuels was 3.23 million b/d, up from 3.18 million b/d in 2015. Crude oil made up 2.5 million b/d, and the remainder was produced as biofuels, natural gas, and other liquids (NGLs) (Figure 3). In 2016, oil production exceeded consumption for the first time since 2009. According to ANP, a growing share of production is coming from Brazil's oil deposits in the pre-salt layer, making up approximately 47% of total Brazilian output as of January 2017. In July 2017, output from pre-salt offshore wells surpassed combined volumes from all other fields for the first time. This figure is expected to climb further in the coming months as Petrobras brings on-stream new units at the Libra, Lula, Tartaruga Verde, and Tartaruga Mestiça offshore fields. Petrobras and its partners (Royal Dutch Shell Plc, France's Total SA, China's CNOOC and National Petroleum Corp) will install the first of four commercial production systems in the Libra offshore oil area in 2020, adding one per year through 2023. Each of the floating, production, storage and offloading (FPSO) vessels will have the capacity to produce 180,000 b/d, according to Petrobras. The Libra area holds an estimated 8 billion to 12 billion barrels of oil and equivalent natural gas, according to ANP. This lease is Brazil's first-ever under a production-sharing system with the government. Unless major refining capacity is added in Brazil, oil product demand is expected to continue to outpace the country's domestic refining capacity. Brazil had a total of 2.3 million b/d of crude oil refining capacity at 17 refineries in 2016, a slight increase from 2015. Petrobras operates 13 of these refineries, which together have a total processing capacity of 2.2 million b/d for oil and natural gas liquids (NGL), accounting for 92% of the country's crude distillation capacity. Most of the refineries are located near demand centers on the country's coast. Because Brazil's refineries do not have the technical capabilities to process heavier crude oils, the country must export some of its heavy crude oil and import lighter crude oil. Brazil's refinery utilization reached a five-year low during the first quarter of 2017 because Petrobras kept crude runs low at its facilities, given the deteriorated demand environment, and focused its investments on the E&P sector. 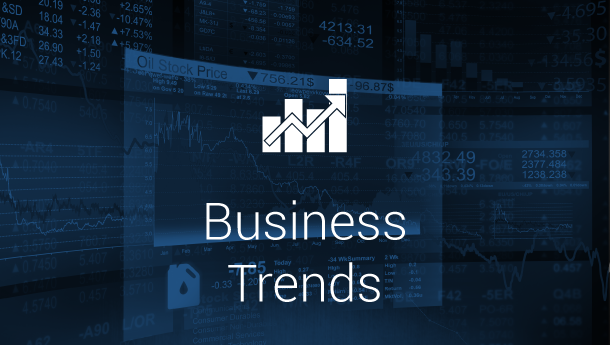 Petrobras has reduced total investments across the company by 25% compared with the last review of its Business and Management Plan 2015-2019. In November 2014, the Abreu e Lima, RNEST, refinery began processing crude oil, marking the first greenfield refinery addition in Brazil in more than a decade; the second 115,000 b/d phase is expected to be completed by 2020. Petrobras plans to resume work on the sulfur emissions reduction unit (SNOX) in 2017, with expected startup in 2018. In 2017, Petrobras approved the re-evaluation of the Petrochemical Complex of Rio de Janeiro, Comperj, project, located in the city of Itaboraí, Rio de Janeiro. Petrobras is expected to complete the first unit at the 165,000 b/d Comperj refinery by December 2020., In early 2015, Petrobras officially canceled the 600,000 b/d Premium I and 300,000 b/d Premium II refineries because of the company's critical financial situation. Petrobras's wholly-owned subsidiary, Transpetro, services Petrobras' oil and natural gas production, logistics, and refining and distribution areas by carrying and storing oil, natural gas, derivatives, and biofuels. Transpetro carries imported and exported cargo of oil and other products. Its main clients, in addition to the Petrobras System, are distribution and petrochemical companies. Brazil exported approximately 798,000 b/d of crude oil in 2016, an 8% increase from the previous year. China, the largest importer of Brazilian crude oil, imported about 296,000 b/d in 2016, an increase of more than 17% from 2015. Uruguay was the second-largest importer of Brazilian crude oil in 2016, with 100,000 b/d. The Asia-Pacific region and Central and other South America regions made up the largest export market for Brazil, at 46% and 32%, respectively in 2016. China by alone accounted for 37% of total crude oil exports to Brazil in 2016 (Figure 4). Brazil imported its largest volume of crude oil from Africa and the Middle East, making up 54% and 40%, respectively, of its total. Crude oil from Saudi Arabia accounted for 35% of Brazil's total crude oil imports in 2016. To meet the rising domestic demand, compensate for its fuel price subsidies, and supplement its underinvestment in the refining sector, Brazil continues to be an importer of petroleum products. In 2016, the country imported 488,000 b/d of petroleum products. The United States was the largest source of Brazil's petroleum products imports, accounting for 229,000 b/d of imports in 2016. The transportation sector accounts for a large share of petroleum products demand. In 2016, Brazil's energy consumption in the transportation sector was 84 million tons of oil equivalent (Mtoe), with diesel oil accounting for 44%, gasoline accounting for about 30%, and ethanol accounting for 17%. The world's largest oil discoveries in recent years are in Brazil's offshore, pre-salt basins. Pre-salt oil is generally characterized as oil reserves situated exceptionally deep, below the ocean, under thick layers of rock and salt, requiring substantial investment to extract. The large depth and pressure involved in pre-salt production present significant technical hurdles that must be overcome. In 2005, Petrobras drilled exploratory wells near the Tupi field and discovered hydrocarbons below the salt layer. In 2007, a consortium of Petrobras, BG Group, and Petrogal drilled in the Tupi field and discovered an estimated 5-8 billion barrels of oil equivalent (boe) resources in a pre-salt zone 18,000 feet below the ocean surface under a thick layer of salt. For comparison, EIA defines ultradeep drilling in the Gulf of Mexico as 5,000 feet or more. Further exploration showed that hydrocarbon deposits in the pre-salt layer extended through the Santos, Campos, and Espírito Santo basins. Following Tupi, many pre-salt finds were announced in the Santos Basin. Pilot projects in the Lula and Sapinhoá fields in the Santos Basin began production in 2009 and 2010, respectively. With the exception of the Libra field, all pre-salt areas currently under development were non-competitively granted to Petrobras. 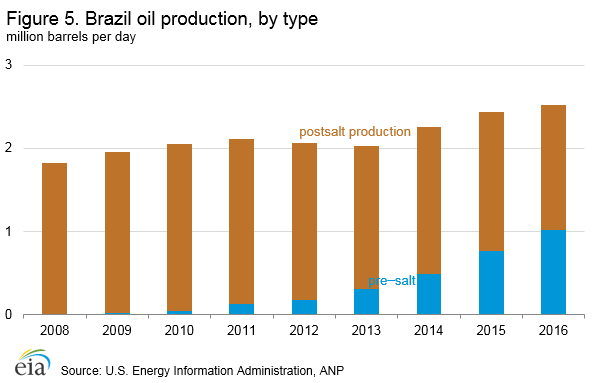 Brazil's average pre-salt oil production for 2016 was a record high of 1.02 million b/d of oil, surpassing 2015 production by 33% (Figure 5). Several fields experienced significant production growth, including the Lula field, the Sapinhoá field located in the Santos Basin, and the Parque das Baleias area (P-58) in the Espirito Santo State's portion of Campos Basin. Additionally, two operations in the Lula field and one in the Lapa field located in the Santos Basin were started in 2016. Before the pre-salt discoveries, Brazilian law allowed all companies to compete in auctions to win concessions and to operate exploration blocks. This law changed in 2010, when the Brazilian government passed legislation instituting a new regulatory framework for the pre-salt reserves. Included in the legislation were four notable components. First, the legislation created a new agency, Pré-Sal Petróleo SA, to administer new pre-salt production and trading contracts in the oil and natural gas industry. The second component allowed the government to capitalize Petrobras by granting the company 5 billion barrels of unlicensed pre-salt oil reserves in exchange for a larger ownership share. The other two components established a new development fund to manage government revenues from pre-salt oil and to lay out a new production-sharing agreement (PSA) system for pre-salt reserves. In contrast to the concession-based framework for non-pre-salt oil projects, where companies are largely uninhibited by the state in exploring and producing, Petrobras will be the sole operator of each PSA and will hold a minimum 30% stake in all pre-salt projects. However, to incentivize companies, the PSA will also include a signing bonus of $6.6 billion and a low-cost recovery cap. In 2016, Brazil's government passed an offshore oil bill that allows greater private and foreign investment in the development of Brazil's offshore oil blocks. With the change, Petrobras changed from mandatory operator to preferred operator, allowing the company to choose which biddings for blocks in the pre-salt areas it wanted to participate in ANP is authorized to conduct three bidding rounds in 2017- the 4th Round of Marginal Fields, the 2nd Production Sharing Round, and the 14th Round under the "Concession regime." To address the country's dependence on oil imports and its surplus of sugarcane, the government implemented policies to encourage ethanol production and consumption beginning in the 1970s. Total biofuels production in Brazil in 2016 was 560,000, a 4.3% decrease from 2015. Brazil is the second-largest producer and consumer of ethanol in the world after the United States. Total ethanol production fell to 494,000 b/d in 2016, 6.7% lower than in 2015, according to the ANP (Figure 6). In Brazil, ethanol and gasoline are competing products in a market where flex-fuel vehicles account for 60% of the total domestic vehicle fleet. Hydrous ethanol (E100) is the substitute product flex-fuel vehicle owners switch to when its price is at or lower than 70% of the gasoline price. In 2015, Brazilian motorists consumed more ethanol than gasoline despite falling oil prices, ending several years of rising gasoline sales incentivized by prices that were largely subsidized by Petrobras. From 2014 to 2015, gasoline consumption dropped from 764,000 b/d to 708,000 b/d, while E100 consumption increased from 224,000 b/d to 308,000 b/d. The Brazilian government raised the ethanol blend requirement in gasoline to 27% in February 2015. The government is considering an increase to 27.5% as a measure to reduce gasoline imports. However, the ethanol industry is struggling because of land and labor cost increases as well as government-imposed gasoline price controls, which are undermining the competitiveness of ethanol as an oil substitute. In addition, sugarcane, which is the feedstock in Brazil's ethanol production, is highly sensitive to weather. Crop yields can swing considerably year to year, adding significant uncertainty and costs. In 2016, Brazil exported approximately 30,000 b/d of ethanol, down more than 40% from its highest level of exports in 2012. Brazil's biggest export market in 2016 was Asia-Pacific with 45% of ethanol exports going to that region. Ethanol exports to the United States were 13,700 b/d, representing 44% of total Brazilian ethanol exports (Figure 7). Brazil also produces biodiesel. In 2016, the country produced approximately 65,000 b/d of biodiesel, a 3.5% decrease from 2015. 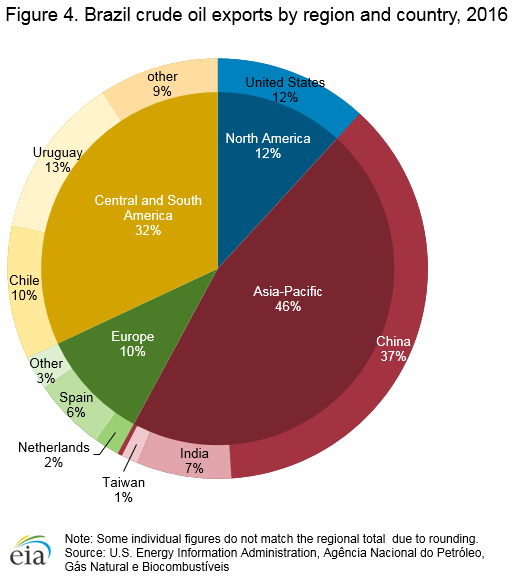 More than three-quarters of biodiesel is produced from soybean oil., More than 43% of biodiesel production is concentrated in Brazil's central west region of the country. In March 2016, Brazil increased the biodiesel-use mandate from 7% (B7) to 10% (B10) by 2019, with the following implementation timeline: 8% (B8) by March 2017; 9% (B9) by March 2018; and 10% (B10) by March 2019. 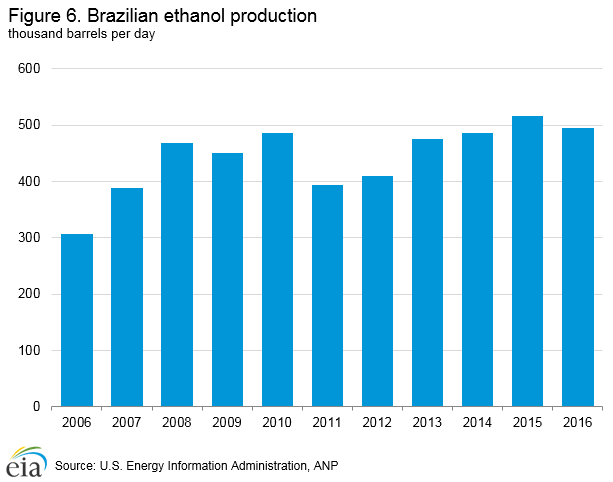 Although Brazil is a major ethanol producer, the country imported more than 14,000 b/d of ethanol in 2016 (down 62% from 2015), and nearly all imported ethanol came from the United States. 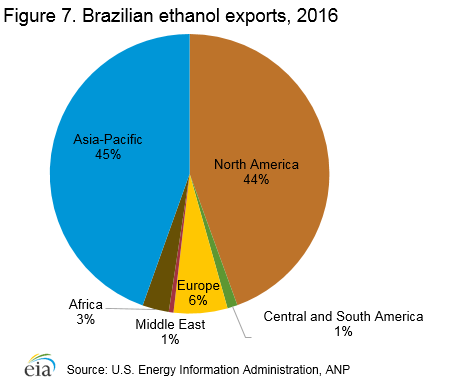 Brazil is a significant market for American ethanol exporters because of several factors. Historically, droughts in Brazil have forced the country to import ethanol. In addition, if sugarcane is not quickly processed into ethanol, the crop is prone to rot. The seasonality of sugarcane harvests leaves Brazil with an off-season from January to March. In Brazil, ethanol production is also highly sensitive to commodity prices. For example, because sugarcane is used for ethanol production, high sugar prices may entice producers to switch to sugar production instead of ethanol production. Finally, demand in Northeast Brazil for imported ethanol has been strong as a result of insufficient local production and the higher cost of transporting ethanol from Southern Brazil. In August 2017, Brazil's foreign trade chamber, Camex, approved a 20% tax on ethanol imports after a 600 million liter per year quota (10,339 b/d) is exceeded. In the first half of 2017, Brazilian ethanol imports reached 1.29 billion liters, a 330% increase compared to the same period a year earlier. The import tax ends an agreement between the two largest ethanol producers in the world, Brazil and the United States, to keep global ethanol trade free of taxes as a way to boost the industry and the market. CAMEX stated that the tax will be in place for two years, and after that would be reevaluated. Despite Brazil's significant reserves, natural gas accounted for only 11% of Brazil's total primary energy consumption in 2016. Brazil's natural gas reserves are located primarily offshore in the Campos Basin. Petrobras plays a dominant role in all links of the natural gas supply chain. In addition to controlling most of the country's natural gas reserves and being responsible for most domestic Brazilian natural gas production, it also manages natural gas imports from Bolivia. Petrobras controls the national transmission network, and it has a stake in 21 of Brazil's 27 state-owned natural gas distribution companies. Petrobras owns and operates virtually all of Brazil's pipeline infrastructure through its subsidiary company Transpetro. In the upstream and the midstream sector, Brazil's Ministry of Mines and Energy (MME) sets policy, and the ANP is the regulatory authority. In the downstream sector state agencies oversee regulation. In April 2017, Petrobras sold a 90% stake in its natural gas pipeline unit, Nova Transportadora do Sudeste SA, to a consortium of foreign investors for $5.2 billion. Petrobras plans to continue divestment by selling its liquefied petroleum gas (LPG) distribution unit, Liquigas, to the Brazilian firm Ultrapar for $819 million. In mid-2016, MME launched the initiative Gas to Grow. This initiative "aims at improving the regulatory framework of the sector, laying the groundwork for a competitive market by adopting best international practices" to "build a favorable environment for new investments." In April 2017, Energy Minister Filho announced that Brazil would reach self-sufficiency in natural gas supply within five years, benefiting from ultra-deepwater hydrocarbon production. Brazil currently relies on Bolivia to meet its natural gas needs, importing under a supply agreement that expires in 2019. In particular, Petrobras expects strong production from pre-salt resources in the Pão de Açúcar in the Campos basin and Carcará fields starting in the early 2020s. According to the Oil & Gas Journal, Brazil held 15 trillion cubic feet (Tcf) of proved natural gas reserves at the beginning of 2017, second in South America after Venezuela. Most of Brazil's natural gas reserves (84%) are located offshore, and 73% of offshore reserves are concentrated off the coast of the state of Rio de Janeiro. Of the country's onshore natural gas reserves, 59% of the reserves are located in the state of Amazonas. In 2016, Brazil produced 827 billion cubic feet (Bcf) of natural gas, a slight increase from 2015 as Brazil continues to develop its offshore reserves in 2015 (Figure 8). Offshore production accounted for 77% of the natural gas produced in Brazil. Nearly half of all offshore natural gas production is concentrated off the coast of Rio de Janeiro. Given the high level of associated gas from offshore oil fields, much of Brazil's production is reinjected. Brazil's consumption of natural gas was 1.3 Tcf in 2016, a slight decrease from the high of 1.5 Tcf (Figure 8).Natural gas demand from the industrial sector was a little more than 50% of the country's total natural gas consumption in 2016. Recent announcements about additional natural gas discoveries in Brazil's offshore pre-salt layer have generated excitement about new natural gas production. Along with the potential to significantly increase oil production in the country, the pre-salt areas are estimated to contain sizable natural gas reserves as well. Production of natural gas in the pre-salt layer grew 36% year over year from 2015 to 2016, according to ANP. Associated natural gas projects in the massive pre-salt oil fields (Campos and Santos Basins) will account for the bulk of production growth looking forward. Despite the trend in rising domestic production from pre-salt discoveries, the gap has not closed between Brazil's supply and demand (Figure 8). However, decreasing demand for natural gas and continued domestic production growth helped Brazil reduce reliance on liquefied natural gas (LNG) imports in 2016. The Brazil pipeline system is a networks of pipes situated predominantly along the southeast and northeast areas of the country, from the state of Rio Grande to Sul to Ceará. For years these pipelines were not interconnected, which hindered the development of domestic production and consumption. However, in March 2010, the Southeast Northeast Integration Gas Pipeline (GASENE) linked these two markets for the first time. This 860-mile pipeline, which runs from Rio de Janeiro to Bahía, is the longest pipeline in Brazil. The other major natural gas market in Brazil is the Amazon region. In 2009, Petrobras completed construction of the Urucu pipeline linking Urucu to Manaus, the capital of Amazonas state. This project is expected to facilitate development of the Amazon's considerable natural gas reserves. In May 2016 Petrobras brought online its OCVAP 1 pipeline from its Caraguatatuba gas treatment unit to the Rvanp refinery in Sao Paulo State, transporting pre-salt gas from Brazils's southeast coast. A third pipeline moving pre-salt gas operated by Petrobras is expected to come online in 2020. 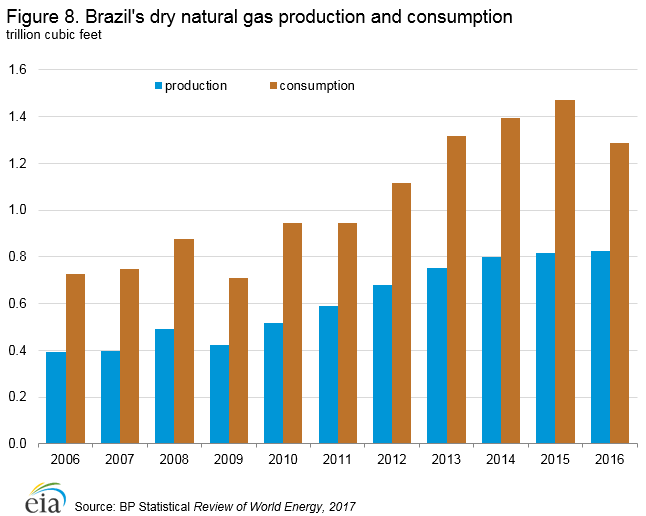 Brazil imported 470 Bcf of natural gas in 2016, a 30% decrease from 2015 (in 2015, natural gas imports were high because of drought conditions that reduced hydroelectric power availability). Of this amount, 78% came from Bolivia (via pipeline), and the remainder was LNG imports primarily from Nigeria, Qatar, the United States, and Trinidad and Tobago. Brazil imports natural gas from Bolivia through two pipelines. The Gasbol pipeline, established in 1999, links Santa Cruz, Bolivia, to Corumbá, Brazil, and continues to São Paulo, Brazil. 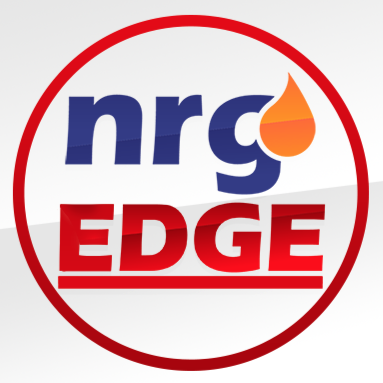 The 1,960 mile pipeline has a maximum capacity of 1.1 billion cubic feet per day (Bcf/d). The 98 million cubic feet per day (MMcf/d) San Matías pipeline runs from San José de Chiquitos, Bolivia, to San Matías, Brazil, and then connects to the GasOcidente pipeline to supply the Empresa Productora de Energia Ltda power plant in Cuiabá. LNG demand grew significantly in Brazil between 2012 and 2015 as a result of increased natural gas use for electric power generation. During those years, low rainfall levels limited the availability of hydroelectric power. Robust economic growth also contributed to industrial demand growth, as well as overall power demand growth. However, the return of normal rainfall levels at the end of 2015 as well as the second consecutive year of economic recession reversed these trends sharply in 2016, cutting deeply into natural gas demand. With gradually increasing production and limited demand growth, LNG imports are likely to remain relatively low. However, LNG imports are expected to rise again beginning in the early 2020s, when the country's first long-term sale and purchase agreement (SPA) to supply the Centrais Elétricas de Sergipe S.A (CELSE) LNG-to-wire project starts. Brazil has three LNG regasification terminals with a combined capacity of 1.4 Bcf/d: the Pecém terminal in the northeast, the Guanabara Bay terminal in the southeast, and the TRB terminal in the state of Bahía. The facilities are floating regasification and storage units (FRSU). In June 2017, the Guanabara Bay FRSU was closed because of weak natural gas demand. The Guanabara Bay infrastructure has not been decommissioned, however an FSRU, either newly-chartered or one relocated from another terminal, would be required for imports to restart. Brazil has the third-largest electricity sector in the Americas behind the United States and Canada. Brazil had an installed generating capacity of 150 gigawatts (GW) in 2016, a 6.8% increase from 2015, according to the MME. Hydroelectric power accounted for 97 GW of generating capacity, oil and gas sources 24 GW, coal 3 GW, biomass 14 GW, and smaller amounts from wind, nuclear, and solar made up the remainder. Renewable sources accounted for 81% of total installed capacity in 2016. Brazil also had 6 GW of contracted electricity imports, bringing the total power supply to 156 GW. National Electric Energy Agency (ANEEL) said developers brought online 9.5 GW of capacity in 2016, the highest amount since records began in 1998. The generation ramp-up comes despite a prolonged recession that has eroded electricity demand and led to fears of a supply glut. Brazil generated 579 gigawatt hours (GWh) of electricity in 2016. Public service power plants accounted for 480 billion kWh, self-producers accounted for 98 billion kWh, and the remainder was either traded or accounted for as losses. In 2016, final end-use consumption of electricity was 520 billion kWh, a slight decrease from the previous year. The industrial sector consumed 195 billion kWh, the residential sector consumed 133 billion kWh, and the commercial and public sector consumed 132 billion kWh. Most of Brazil's generation capacity is located far from urban demand centers, which requires significant investment in transmission and distribution systems. The Madeira transmission line, completed in 2014, is the longest high-voltage, direct-current line in the world and spans 1,476 miles to link hydropower plants in the Amazon Basin to major load centers in the southeast. Increased emphasis on distributed generation will help reduce the need for additional transmission infrastructure in the future. The government plays a substantial role in the Brazilian electricity sector. Until the 1990s, the government almost completely controlled the electricity sector. Brazil initiated an electricity sector privatization process in 1996 that led to the establishment of ANEEL. Although the electricity sector was privatized in the early 2000s, the bulk of Brazil's major generation assets remain under government control. Eletrobrás, a state-owned holding company, is the dominant player in the electricity market. The government also owns almost the entire electricity transmission network. In 2004, the Brazilian government implemented a new model for the electricity sector. This hybrid approach to government involvement splits the sector into regulated and unregulated markets for different producers and consumers. This approach allows for both public and private investment in new generation and distribution projects. Under the plan, Eletrobrás was formally excluded from privatization efforts. In August 2017, the Brazilian government announced its intention to divest its controlling stake in Eletrobrás, with its sell-off complete by mid-2018. The sale will not include Eletronuclear (a nuclear power company owned by Eletrobrás) or the Itaipu hydroelectric dam. Brazil generated 381 billion kWh of hydroelectric power in 2016, an increase of almost 6% from 2015. Many of Brazil's hydropower generating facilities are located far from the main demand centers, resulting in high transmission and distribution losses. 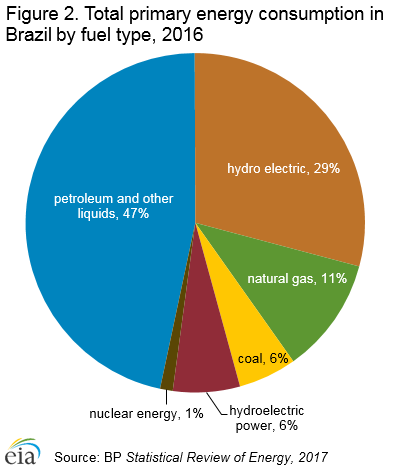 Brazil currently depends on hydropower to provide more than two-thirds of its electricity while natural gas- and diesel-fired plants are used only to meet peak demand or as backup baseload sources. Increased droughts in Brazil have led to concerns over hydroelectric power generation. Water reservoirs have experienced decreased water levels since 2013, made worse by the 2015 - 2016 El Niño event in the southeast region which caused worst water shortage seen in 35 years. As hydroelectric output fell during this period, generation from other fuels such as natural gas and liquid fuels increased. With the arrival of the 2016 rainy season the drought in Brazil eased, except in the Northeast where reservoirs remained at historically low levels. ANEEL raised electricity prices in April 2017 to help providers meet the costs of increased thermal power as a result of low levels of hydropower generation. Energy Minister Fernando Coelho Filho indicated that the government was weighing the options of including natural gas-fired power within the baseload mix, given the continued hydropower issues and the cost associated with relying on uneven power generation from those plants. The world's largest hydroelectric plant by installed generation capacity is the 14 GW Itaipu hydroelectric dam on the Paraná River, which Brazil operates with Paraguay. According to Itaipu Binacional, the facility generated a record 103 million MWh of electricity in 2016, benefitting from higher rainfall and improved operating efficiency. Although Brazil is weighing plans to reduce hydropower in the generation mix to mitigate the risk of supply shortages as a result of dry weather, new hydro projects continue to move forward. Most notable among these projects is the Belo Monte plant in the Amazon Basin, which upon reaching full operating capacity in 2017, will have the third-largest hydroelectric plant capacity in the world behind China's Three Gorges Dam and the Itaipu Dam. Brazil has two nuclear power plants, the 640 megawatt (MW) ANGRA 1 and the 1,350 MW ANGRA 2. State-owned Eletronuclear, a subsidiary of Eletrobrás, operates both plants. The ANGRA 1 nuclear power plant began commercial operations in December 1984, and the ANGRA 2 began commercial operations in December 2000. Construction of a third plant, the 1,405 MW Admiral Alvaro Alberto Nuclear Power Station (CNAA), formerly ANGRA 3, started in 1984 and is continuing after a period of suspended activity. Eletronuclear anticipates that the power plant will enter into commercial operations by May 2018. Nuclear power accounted for 1,990 GW of installed generating capacity (1.5% of total) in Brazil in 2016. Nuclear power accounted for 16 GWh of electricity generation in 2016, an increase of 7.7% from the previous year. Nuclear energy consumption was 16 terrawatt hours (TWh) in 2016, up 7.5% from 2015. Photovoltaic (PV) solar generation capacity in Brazil, including distributed generation (DG) systems, in Brazil increased 332% between 2015 and 2016. As of June 2017, Brazil had 273 MW of PV solar in its generation mix, up from around 1 MW five years ago. An additional 530 MW is expected to come online by the end of 2017, with 1.34 GW connected to the grid in 2018. By 2024, the government expects Brazil's overall solar capacity to exceed 8 GW. In June 2017, Enel Green Power Brasil announced the start of commercial operations at the Lapa complex in the northeastern state of Bahia. The solar park operates installed capacity of 158 MW, comprising the Bom Jesus da Lapa (80 MW) and Lapa (78 MW) plants. In September 2017, Enel Green Power Brasil commenced operations at its Ituverava (254 MW) and Nova Olinda (292 MW) solar parks. 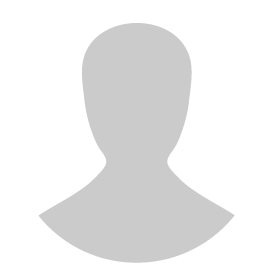 Ituverava is located in the municipality of Tabocas do Brejo Velho, in the north-eastern state of Bahia, while Nova Olinda is located in the municipality of Ribeira do Piauí, in the north-eastern state of Piauí. These projects combined total 546 MW and are South America's largest PV facilities currently in operation. Data presented in the text are the most recent available as of November 21, 2017.